There’s a wealth of things to see and do in Ramsgate. 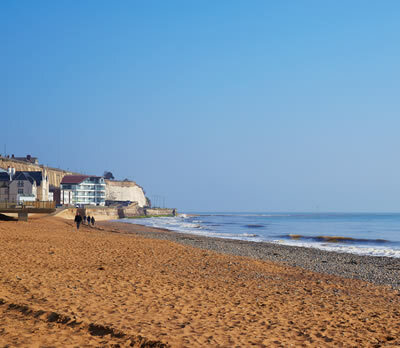 Thanet teams a vibrant present with a rich past - Arguably one of the most dramatic coastlines in the whole of the UK including the White Cliffs of Dover, medieval Sandwich, historical Ramsgate right through to popular Whitstable. A stunning landscape of sweeping beaches and ports. If you love food and eating out, then you’ve come to the right place. Set in the Garden of England, Ramsgate and its neighbouring towns and villages in East Kent offer a wide choice of restaurants. The Isle of Thanet is perfect cycling and walking territory, with its network of trails that take you through towns, countryside and along the coast. Topping the bill is the 32-mile Viking Coastal Trail. This corner of Kent has some of the best links golf courses in the country. Princes Golf Club in Sandwich is the beginning of this holy grail of seaside links with Royal St Georges situated next door. The beach is perfect for lots of free fun for the kids. But on rainy days you may want to rethink. There is still plenty to do indoors. For young ones, there are some great indoor play areas – Helter Skelter in Broadstairsand Jungle Jims at Quex. At Quex, there is also paintballing and build a base for hours of active fun. Revolution Skate Park in Broadstairs has three large skate areas, plus various climbing walls.